Nothing should go wrong with a package like that. What we didn’t book in advance was decent weather. And the persistent, heavy rain did kill a bit of the fun for us. But as they say, there is no bad weather, only unsuitable clothing. And we had all of our raingear on! 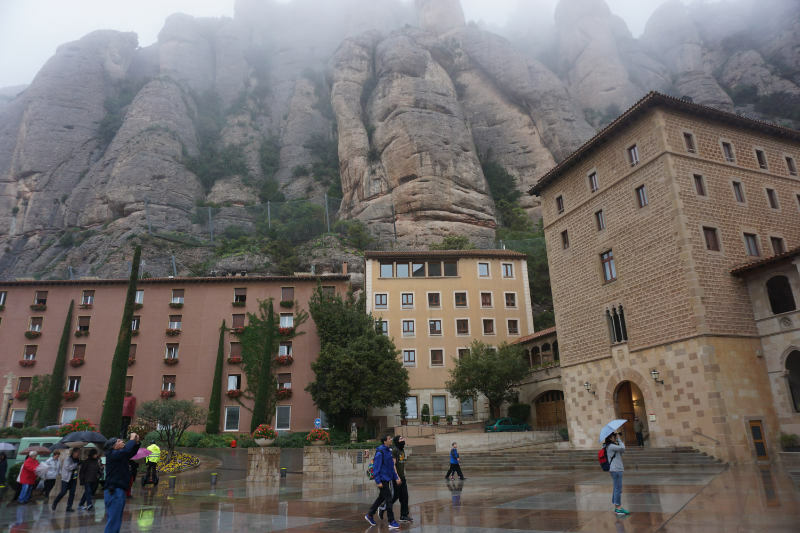 Montserrat is a sandstone mountain range in the hinterland of Barcelona. It is about 1200 meters high. Beneath the eastern summit, at a height of 720 meters, is the monastery. 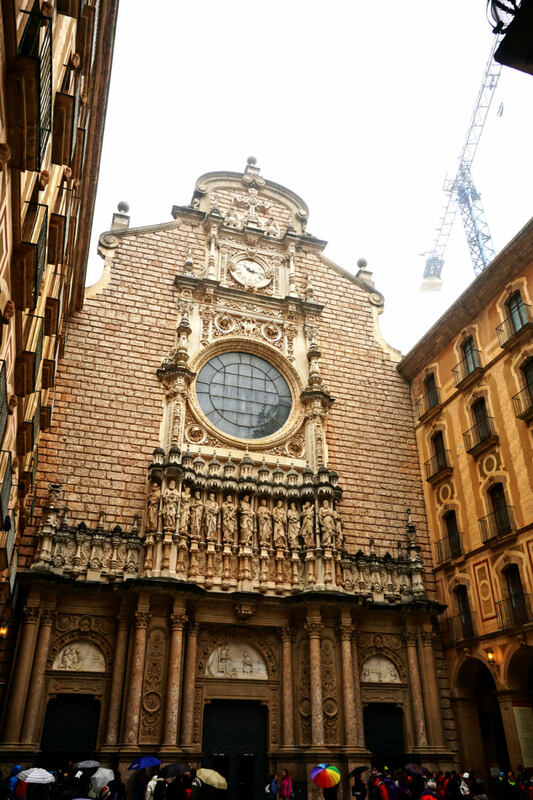 It is a Benedictine monastery and home to the boy’s choir l’Escolania de Montserrat. About 80 monks reside in the monastery. Numerous pilgrims come to the monastery to see its Marian image Our Lady of Montserrat. A unique depiction of a Black St. Mary. The first train to Montserrat from Barcelona leaves at 8.36 in the morning. This is the train we decided to take. 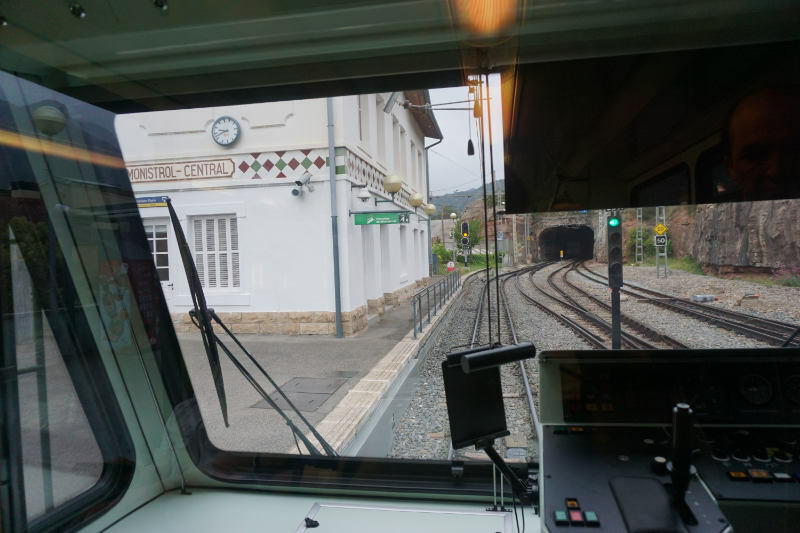 It took an hour to reach the cogwheel railway in Montserrat. Without a wait, we proceeded onto the cogwheel railway which took us up to the monastery in 15 minutes. I am sure the view is spectacular when the weather is nice. 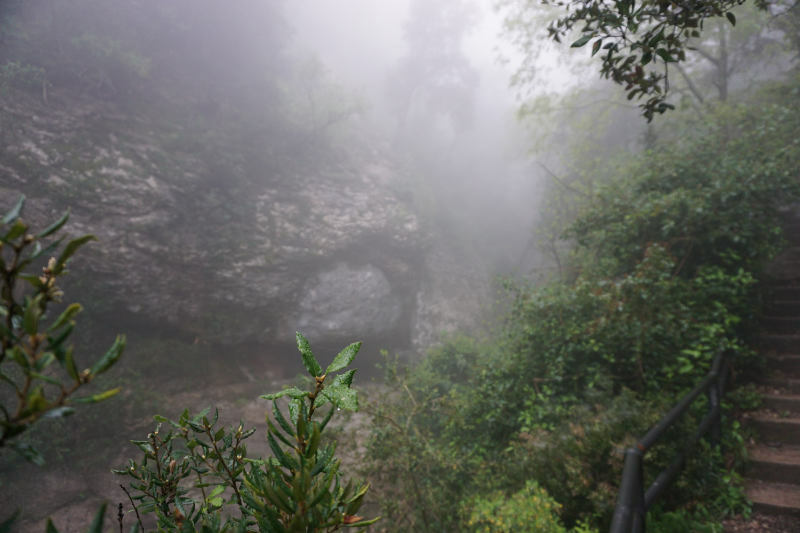 The low hanging clouds that we encountered gave the whole scenery a surreal and eery touch. The impressions we did get were still fabulous, regardless of the clouds. The complex is built into the hillside and optically melts into its surroundings. A very impressive sight. Once we had reached the monastery there was still a little time left until our pre-booked time window for the audio-visual tour. So we started to walk towards the church. To be honest, I was shocked. The yard was one huge babel of voices. Crowds with backpacks and sleeping mats oozed out of the church, youth groups were shoving each other around and shouting guides constantly herded people into new groups. This was far from peace and quiet in a monastery! One of the 6 morning services had just ended and apparently many of the visitors had stayed the night in one of the monastery’s accommodations and were now on their way home. This whole scene resembled a busy train station more than it did a place of worshipping. The first thing we did was running away from all the others by joining the very lovely audio-visual tour and then proceeding to the museum. It was a lot quieter here and only a few visitors found their way into this area. One reason for that I am sure was that you had to book and pay for this experience. The museum is well worthwhile for art lovers. Wonderful paintings by famous artists are on display. 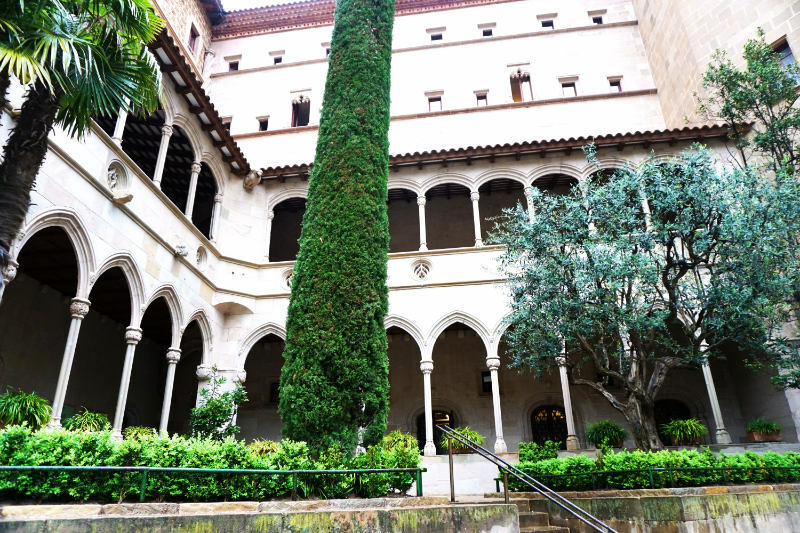 But the museum is not an exhibition about the history and the backstory of the monastery of Montserrat! Now we hope things have quietened down a bit around the church and so we head over to explore the premises. It was definitely quieter than before but still fairly busy. A long queue for the Marian image had already formed about an hour before the next entry. We made short work of this item on our itinerary and scratched St. Mary off the list before we entered the church. Every last seat in the church was taken as morning service number three was held. Here, the silence I had hoped to find in a monastery, was present for the first time during our visit. We, of course, did not understand what was said in the Catalan service, but the atmosphere was beautiful. The choir was there, too, and their performance was deeply moving. The church itself is pompous but not overloaded. I liked it in there. Afterwards, we tried to see some of the surroundings of the monstery despite the thick clouds and the constant drizzle. 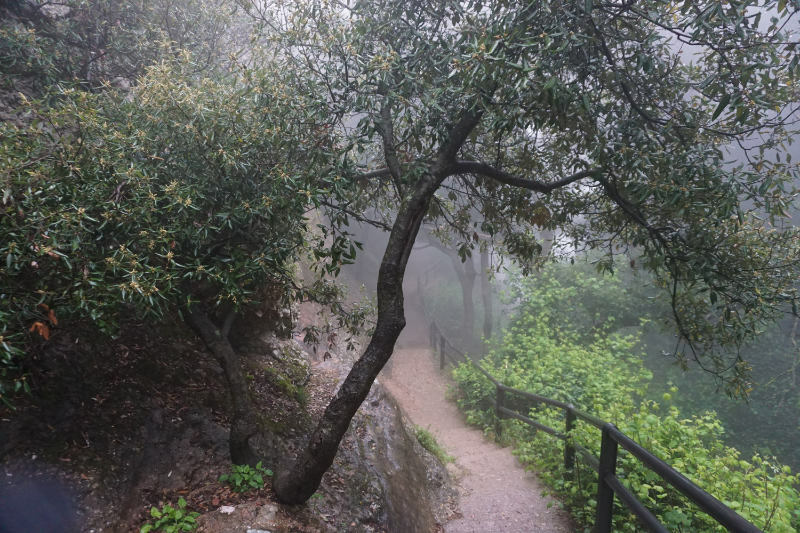 Well maintained hiking trails start right behind the monastery grounds and lead into the surrounding areas. Some of them are accessed by taking the cable cars to higher parts of the mountain range. 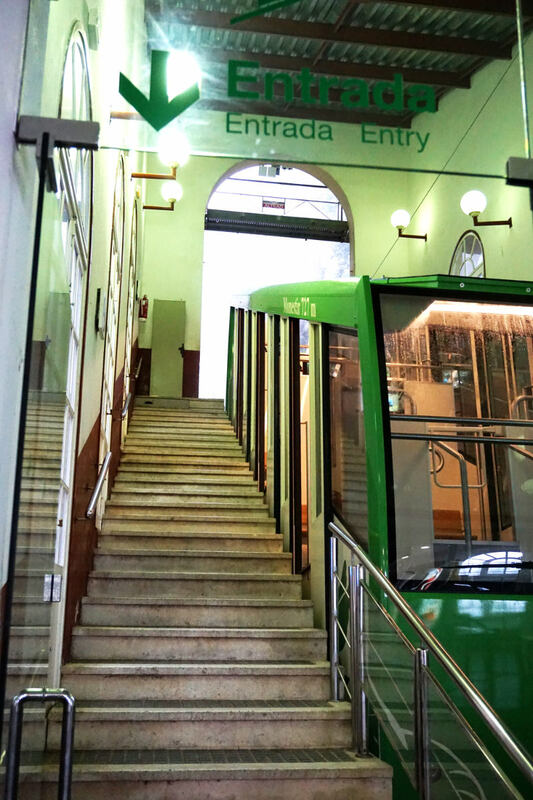 We certainly had to test one of these vehicles and took the Sant Joan cable car up the mountain. The track is very steep and I was pleased that I didn’t have to walk it myself. Helpful signposts led us onto the trail through the mountains and we would have had a marvellous view I am sure if it wouldn’t have been for the clouds. We wandered around for a little while and enjoyed the vegetation and the silence. Due to the weather, we were almost alone up there! The finale of our tour was the pre-booked meal that was included in our package. 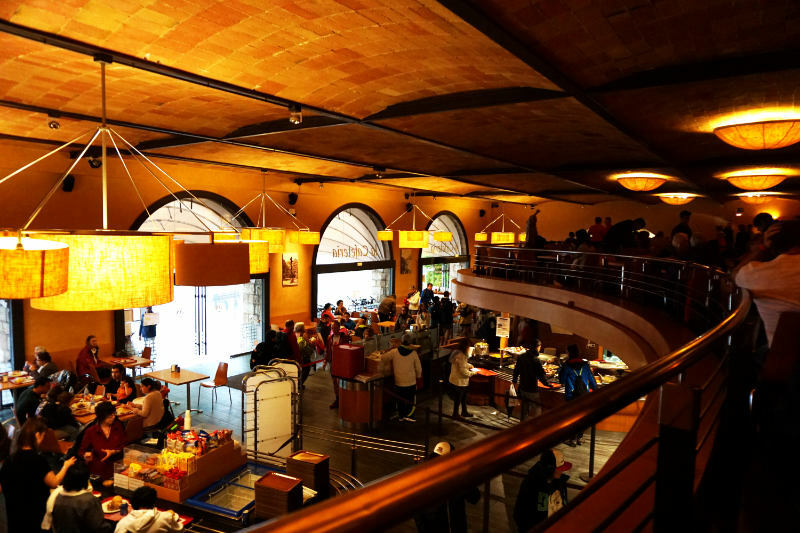 A counter service meal doesn’t necessarily have to be low quality. And this one wasn’t, it was alright. Our booking included soup, mains, dessert and a drink. The best part of the meal was the cake. After the meal, we began our trip back to Barcelona. Pay attention to the departure times of the trains. A direct connection for the train to Barcelona departs only once every hour. We had to wait for 30 minutes at the interchange station for the other guests who were using their cars. 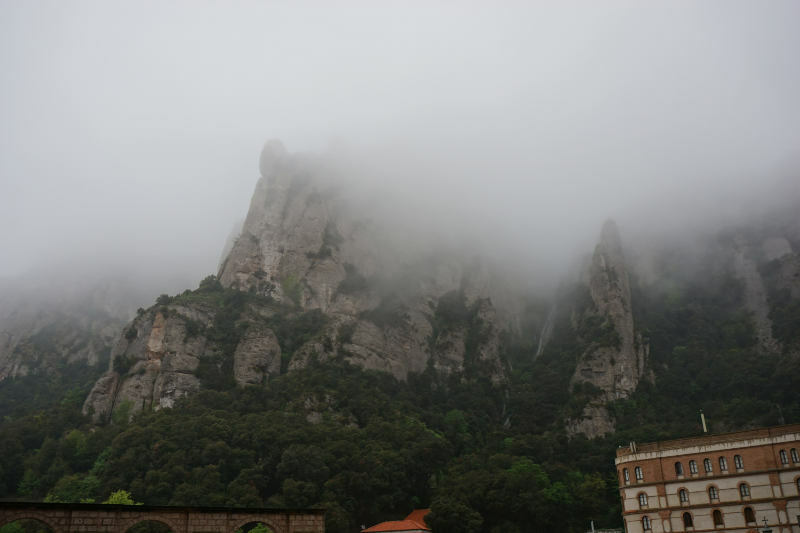 I pictured Montserrat as a quiet place, a real monastery. The surrounding mountains are a little like that I guess, but the monastery grounds are very focused on tourists. In my opinion, it is not the right place for those who have come in search of silence or their faith! That said, I, personally, did not regret having travelled there. We made the best out of the situation and the weather and had fun and an overall pleasant day. I enjoyed our visit and I have taken many lasting impressions home from it.